H. G. Wells once said, ""The most interesting history of the [entire] 19th century was the growth of the United States."" The years from 1850 to 1875 demonstrate the truth of this assessment. During the Civil War period, familiar aspects of modern life, such as government bureaucracy, consumer goods, mass culture, data profiling, and professionalism began to develop, and a great deal of changes took place. Written in an easy-to-use format, this authoritative volume describes people's everyday lives throughout these years - from the foods they ate to the places they worshipped to the types of jobs they performed. 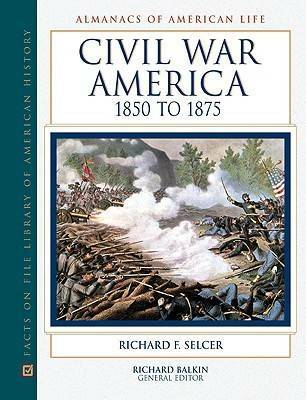 ""Civil War America, 1850 to 1875"" covers American history during the Civil War and Reconstruction. Numerous statistical tables, charts, maps, photographs, and illustrations reveal the diverse aspects of everyday life in Civil War America - from record-keeping and the gathering of statistics to the overhaul of the nation's financial structure, from the bureaucratization of American life to the emergence of mass culture. Lively, informative essays connect and expand on the abundant data, helping factual information come to life. With comprehensive detail and a wealth of primary source material, Civil War America, 1850 to 1875 is the definitive source on this era. The features include: information on climate and natural history, economy, population and health, politics and government, cities and states, prominent people, science and technology, popular culture, and more; special topics, such as the transformation of the United States from an agrarian economy into one of the world's top industrial powers, the rise of spectator sports such as horse racing and baseball, and the development of new forms of transportation; excerpts of period documents, including a slave's firsthand account of his experience - The Homestead Act, Abraham Lincoln's Emancipation Proclamation, and a portion of General Custer's memoirs; more than 150 illustrations, including maps, photographs, copies of visual artworks, and reproductions of advertisements and documents; and a bibliography, a list of tables, and an index.